They are telling people to be “satisfied” by such antics of far left lunatics. This is what passes for mainstream news these days? While Cruz, a man whose spinelessness matches only the loathsomeness of his political views, once said that Kavanaugh might disappoint conservatives if confirmed, he has since changed his tune. In July, Cruz issued a statement in support of the judge, saying, “By any measure, Judge Kavanaugh is one of the most respected federal judges in the country, and I look forward to supporting his nomination to the Supreme Court of the United States.” During Kavanaugh’s hearing, Cruz pitched the nominee an easy one, joking about how the two soft dads both coach their daughters’ basketball teams and inquiring about what Kavanaugh had learned from the experience. So, according to the original author of the piece, Joanna Rothkopf, it’s “spineless” to sit and eat a meal at a restaurant and stand up for what you believe in politically, but somehow it’s “brave” to gather up a gang of protesters to intimidate and harass someone doing that. At one point, one of the protesters yells, “Beto is way hotter than you, dude,” referring to Cruz’s opponent, Rep. Beto O’Rourke. (Cruz has bafflingly attempted to attack him by tweeting a video of O’Rourke condemning the death of Botham Jean, who was shot and killed in his home by an off-duty police officer.) Cruz seems to have been particularly wounded by the sentiment, and was spotted looking at a picture of him on a flight Tuesday morning. These media hacks then go on to criticize Cruz for looking at a picture of Beto O’Rourke on his phone while in a plane seat. So if these antics pass as “acceptable” by the left, just imagine the doors this opens up for Laura Loomer or James O’Keefe. But then again, as the saying goes, “If it wasn’t for double standards, then the left wouldn’t have any standards,” so they’d probably consider it harassing and threatening if Hillary or Jerry Brown were treated like this by conservative activists. In fact, police refused to let Laura Loomer into a recent Keith Ellison event. 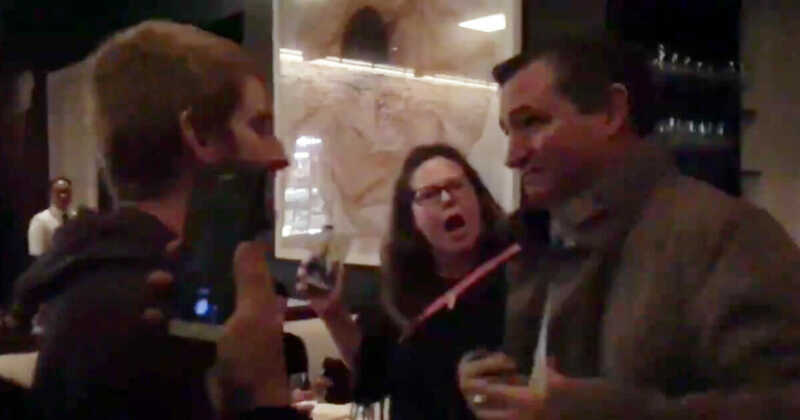 Many of the commenters chime in pointing out how the restaurant didn’t seem to mind the protesters and did nothing to protect Cruz.